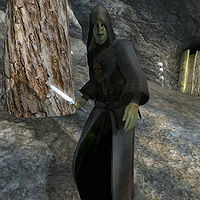 Bolor Savel is a Dunmer necromancer who serves as the doorkeeper at Echo Cave, where he will only appear during the Mages Guild quest Confront the King. He wears the standard necromancer's robes and hood as well as a pair of pigskin shoes. He carries a small amount of gold and the key needed for the related quest. In combat, he relies on a silver dagger and on a set of leveled necromancer spells. He can be found pacing restlessly just outside the entrance to Echo Cave, keeping guard at the King of Worms' stronghold and never even eating or sleeping. Once he detects you, he will immediately run up and enter into conversation with you. Once you approach Echo Cave in the related quest he will greet you with disgust and anger by saying: "You would dare to approach the King of Worms? If you seek an audience with His Grace, you must open this door. I hold the key, and I will die defending it." This speech effectively declares his affiliation with the Necromancers: upon saying it, he becomes a member of the Necromancers Cult, resulting in a 30-point drop in his disposition towards the player, and causing a scripted attack. When Mannimarco first begins his conversation with you, he will briefly mention Bolor's failure to prevent your entry into Echo Cave: "I see Bolor was unsuccessful in delaying you. Very well. I shall reanimate him once we are done here." Sometimes Bolor will not appear at Echo Cave, which makes the cave inaccessible. Reloading a save and approaching from the road may fix this. Killing Bolor Savel without speaking to him first may result in his death being considered a murder.